The uneven quality of Italian army units in the Second World War sometimes obscures the achievements of the better Italian formations. The 132nd “Ariete” Armored Division compiled an outstanding combat record in North Africa, before its destruction attempting to cover the German flight from El Alamein in late 1942. It’s one of the most important formations in our Gazala game. The 132nd Armored Division was officially formed in February 1939 from the 2nd Armored Brigade and 8th Bersaglieri Regiment, but experiments and manuevers had been under way for almost two years by that point and granting the “division” title was a formality. Italian divisions had adopted the old Piedmontese Armata Sarda’s tradition of naming brigades, usually after a city or region (not necessarily that where it was raised) when Mussolini declared all the army’s brigades to be divisions. The 132nd took the name “Ariete,” or “Ram.” The 131st “Centauro” armored division formed at the same time, from the 1st Armored Brigade. When Centauro deployed to Albania in April, the Littorio legionary division (a formation made up of army “volunteers” that had just returned from the Spanish Civil War) converted to an armored division and took its place in the Armored Corps. Officially the armored divisions took their recruits from all over Italy, but in practice most of Ariete’s men came from the big cities of northern Italy, particularly Milano. 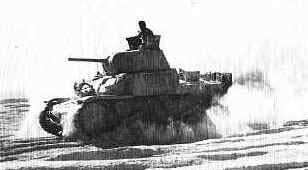 Ariete sent two tank battalions to the Italian colony of Libya in late 1940 to face the British, where both were destroyed at the Battle of Beda Fomm. While they accomplished little, they set a standard of near-suicidal bravery that the division would carry for the remainder of its existence. The remainder of the division deployed to Libya in January 1941 and fought continuously until December 1942. The division built an outstanding combat record, but the peak of its performance came at Gazala in May 1942. At the time, Ariete contained the crack 8th motorized Bersaglieri Regiment of three battalions, the three medium tank battalions of the 132nd Armored Regiment (equipped with M13/40 tanks for the most part), one light tank battalion (3rd battalion of the Nizza Cavalleria, equipped with L6 light tanks), two small assault gun battalions with 75mm semovente self-propelled howitzers, an armored car battalion, a motorized engineer battalion and an artillery regiment including a battalion of 90mm anti-aircraft guns and another with German-made 88mm guns. Ariete opened Operazione Venetia, later known as the Battle of Gazala, by overrunning and destroying the 3rd Indian Motor Brigade on the morning of 27 May 1942, but soon suffered heavy losses in an ill-considered attack on the Free French brigade dug in at Bir Hacheim. The division then moved to the rear of the “Cauldron” position. Here the German divisions of the Afrika Korps faced westwards toward the trapped Commonwealth army, while Ariete screened their rear from Allied relief attempts. Ariete repelled repeated British tank attacks on the 29th, delivered with great bravery but little coordination. Italian 88mm and 90mm anti-aircraft guns, used in an anti-tank role, destroyed dozens of British tanks. Still they kept coming. The British tried again on 4-5 June with better organization but no more success. On 11 June Ariete and the Germans began an attack to the east that broke the British tank brigades and led to a general Allied withdrawal. Rommel had won his greatest victory thanks to an Italian armored division. Ariete was successful at Gazala thanks to an experienced organization with high morale and good leadership, and despite the fact that its tanks were badly outclassed by the American-made machines of the British. In an earlier installment we looked at Italian failure to obtain a license to build the Daimler-made PzKw IIIJ. This vehicle could easily have been available to Ariete in place of the outmoded M13/40. We have a small download of the 132nd Armored Regiment as equipped with this more capable vehicle. You can download the new pieces here. Click here to order Gazala now!